Visa Gearing Up For NFC Launches in UK, Working with Banks and Telcos | NFC Times – Near Field Communication and all contactless technology. Visa is working with Telefónica and Vodafone in the UK on planned launches, which country head Marc O'Brien reportedly said are planned for this year. Visa is reportedly gearing up to support a “mainstream launch” of NFC mobile payments, along with a cloud-based digital wallet, according to Marc O’Brien, managing director of Visa UK and Ireland. O’Brien, speaking at the Westminster eForum in London Thursday, said Visa is working with mobile operators Telefónica and Vodafone in the UK, as well as banks and Android device makers, in preparation for mobile-payment launches, reported MarketingWeek. 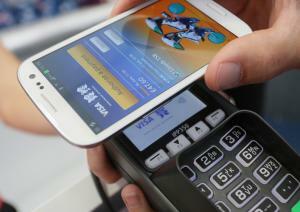 That includes work on security standards for NFC mobile payments, O’Brien was quoted as saying. UPDATE: “Building momentum from the Olympic Games, we’re looking to roll out more contactless cards as well as mobile-contactless payments this year,” O’Brien said, in an amended quote provided to NFC Times by a Visa spokesman. “We’re also working on a digital wallet for cloud-based e-commerce, called V.me by Visa, and that’s coming here, too, this year.” END UPDATE. Article has about 770 words.